Compared to the instrument rating, the commercial was simple. It is basically the proof that you can put your airplane where you want it and you understand its systems in depth. You also need to master a few legal terms – surprisingly no more than a few. The first question of an oral usually is: What will you be able to do with you new commercial certificate? The short answer: Not much. Anytime you are in doubt if you can fly for hire either say no, or call the nearest flight service district office (FSDO). FAR §119.1(e): Here you will find a list of what you can do as a commercial pilot. To do these things you can even advertise yourself, or as the FAA calls it, you can “hold out”. On a simplified list I would include the following operations. FAR §91.501: Here you will find what you can do as a commercial pilot under part 91, which is a paid flight under a contract between you and a certain person or company. This is called private carriage and does not involve holding out. Somebody owns an airplane but isn’t a pilot herself. You can fly under a contract with this person and get paid for it. Somebody heard you are a commercial pilot and asks you to fly him somewhere for compensation in a rental plane. Stop – this is illegal. Hearsay about you being a commercial pilot already counts as “holding out”. If you provide the airplane, you make the impression of being willing to fly anybody, anywhere at anytime – which is basically the definition of common carriage. The maximum number of contracts you can have, without making the FAA think you were willing to carry anybody anywhere at anytime, lies anywhere between eighteen and twentyfour, according to Advisory Circular 120-12A. Common carriage: This is basically airline/charter territory. It is always common carriage if holding out is involved and you are flying for the public from A to B. The main thing to understand is that you are not allowed to compete with these companies. You can get hired by them and earn your money with common carriage. You cannot however, advertise yourself (hold yourself out) for flying anybody from A to B in your plane. Mastering the airplane was easier than I had thought. After all, flying maneuvers is fun and after doing the instrument rating under the hood this is a great way back to stick and rudder flying. Surprisingly I had problems with the lazy eights. I went through five instructors during my training, one after another left for the airlines within a few weeks, and the last one had great advice to master the lazy eight. First, I stopped flying it over a road. This is not a ground reference maneuver and it only distracted me. Second, use cardinal directions to easily visualize where you are. I learned to use the 45 degree point for the highest pitch and half bank (15°), the 90 degree point for the zero pitch attitude and steepest bank (30°), then the 135 degree point for lowest pitch and half bank (15°). This technique didn’t work for the previous instructors but it worked well for me. 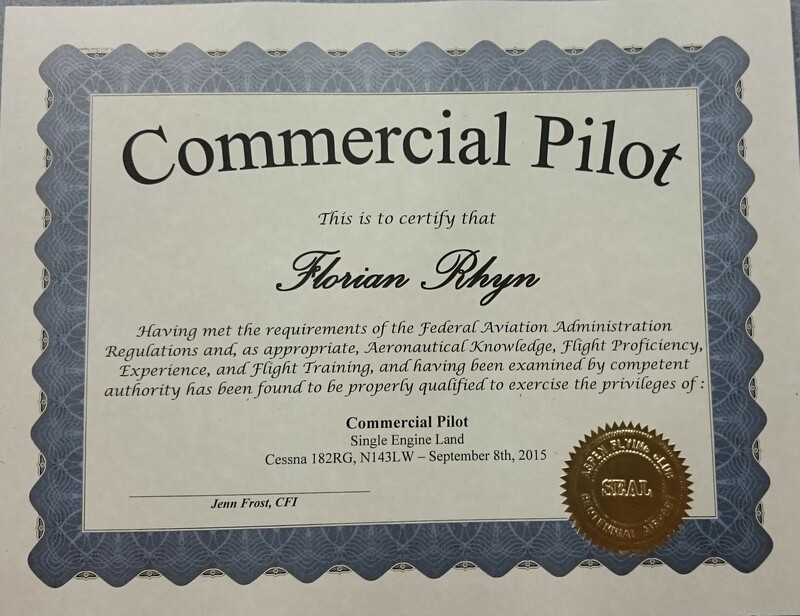 Last but not least, the commercial is a private pilot course on steroids. Know everything you had learnt from your PPL in great detail. Is a transponder required below/above Class C airspace? Anybody? 😉 One thing I did before the exam, after I didn’t know what to study anymore, were the quizzes and online courses of www.boldmethod.com and www.aopa.org. Great tips! Especially since I am preparing my commercial checkride.